Harriett Baldwin welcomes one of the changes announced today, and will fight the rest. 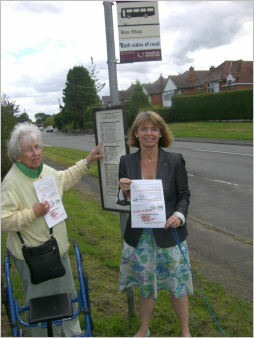 Harriett Baldwin said: "I am very pleased to hear that the Post Office in Callow End will stay open for longer each week. It will move from the Bluebell pub to the the village shop, but it will now be open for 46 hours each week. I hope that villagers will welcome this, as the two businesses are only 500 yards apart. However, I am very concerned about the closure of Rushwick, Malvern Link Top and Poolbrook. The Post Office have incorrectly stated that the distance from Rushwick PO to the St. John's PO is 1.5 miles, where I measured 1.7 miles. The route crosses the busy outer ring road. The bus service is infrequent. There is very limited parking in St. John's. Above all, the population West of Worcester will be growing in years to come, as demanded by the government in the regional spatial strategy. This is not joined up government, and I shall be fighting to keep a Post Office service in the village. In addition, some of the service reductions are very drastic, in particular the reduction of coverage in Upper Welland to only 3 hours every Thursday." The Conservative Party have pledged to give Sub Post Offices more freedom to offer a wide range of business services. They would also encourage local councils to open outreach services in local branches. Photo: Harriett campaigning against the closure of Rushwick post office where many residents would be reliant on the infrequent bus service to get to St John's Post Office.